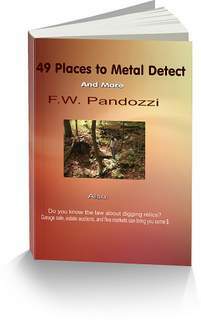 I am still new to the world of metal detectin and spend on average, 4 hours a week scouring the yards of old homeplaces here in central Arkansas. Last week I stopped by a friend's house where he let me do some detecting in his yard, where once stood an old home. 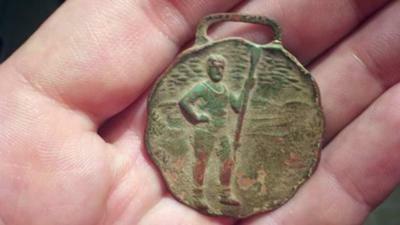 While searching underneath an old clothes line, I unearthed this: A small, thin, embossed copper medal of some kind. I have searched for hours trying to find out exactly what it is. No luck. It appears to be an adolescent boy, wearing shorts, a tank top, hiking boots (?) And holding some type of staff. My first thought was Boy Scouts, but I found nothing related to it. I am stumped. Can anyone identify this piece. It's interesting. Thanks to those who helped with identifying this find. I knew I could count on you. According to a rowing expert and curator of a rowing history museum, this is a late 1800's - early 1900's vintage rowing regatta watch fob, usually purchased by rowing lenthusiasts. It think it's neat to have found this in the hills of Arkansas. I believe the boy has on a rowing outfit and he definitly has what appears to be an oar in his hand. I believe its some type of Regatta Medal recieved from rowing. It looks like a very old track & field award metal, when I was in school I remember simulor metals given out to the first 3 places. If the item were a Boy Scout item, the boy would be in shorts but would be wearing a scout shirt for sure. Never a tank top. So it couldn't be a boy scout medal. Still it is a cool find. Nothing like finding something unique. I will send you a picture if I can get you to email me or tell me how to post it in "my story". Brandon, we would love to see what you found. Maybe someone can explain what it is. Can you upload a picture?